The pulpotomy was done at 1-week post-op, presumably before vitality testing would be accurate after the injury.1 If testing was delayed, would it have benefited the patient? Also, there is no distinction made between apexogenesis (saving the Hertwig's epithelial root sheath [HERS] cells to allow apex closure) versus regenesis of the pulp. If the pulpotomy was further delayed (or only the coronal portion of the pulp removed) could apex closure have been more complete? 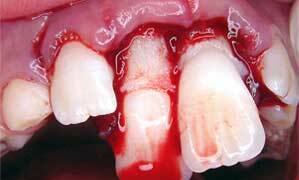 Cehreli ZC, Sara S, Aksoy B. Revascularization of immature permanent incisors after severe extrusive luxation injury. J Can Dent Assoc. 2012;78:c4. This is only an 18-month result.1 What is the likelihood of any longevity to this result? Are there any studies that show a relationship between the vertical position of the new bridge or narrowing forming in the root above the mineral trioxide aggregate (MTA) or the calcium hydroxide and how close this bridge actually gets to the apex or how far it forms away from the MTA or calcium hydroxide? My experience shows this bridge more often than not just a few millimetres above where the MTA filling ends and this can be quite short of the apex—which obviously limits the root canal therapy and can lead to ankylosis, root resorption or both. Figure 1: 30-month control radiograph. Pulpotomy was not performed in the present case. The type of treatment employed was revascularization (or revitalization), a regenerative treatment approach that is quite different than pulpotomy. The latter is generally indicated in traumatic exposures of the pulp. Since this was not the case herein, no distinction was made between apexogenesis (an expected treatment outcome of pulpotomy) and regenesis. In contrast to Dr. Furst's comment, no vitality testing was made before operative procedures, owing to the well-documented lack of reliability of vitality testing in such teeth. In fact, testing was performed months later. Finally, neither pulpotomy (which we did not perform), nor any other type of endodontic treatment could have been delayed in a patient presenting with severe, spontaneous pain, swelling and mobility. We would agree that in traumatized, immature teeth undergoing pulpotomy or partial pulpotomy, apical closure may be more complete by virtue of healthy pulpal and periradicular tissues that promote apexogenesis. The present case, however, was not a case of apexogenesis. Undoubtedly, more published data is required to better predict the short- and long-term outcome of regenerative endodontic therapies. Here, we share the 30-month control radiograph (Fig. 1), which demonstrates a slight narrowing of the root canal with no evidence of a new bridge forming above the coronal MTA barrier. Both findings have been consistently reported in revascularization procedures utilizing calcium hydroxide as an interim medicament.2-4 Clinically, both teeth are now cold- and electric pulp testing (EPT)-positive, with the latter slowly approximating those of neighbouring teeth. We do not know of any study that investigated the vertical position of a new bridge over the MTA, but the increase in dentinal wall thickness—an indicator of root canal narrowing—has been reported both in a qualitative2,5 and quantitative3,4 fashion. Such narrowing indicates strengthening of otherwise compromised root structure, which we believe would outweigh the potential limitations in root canal therapy. Cehreli ZC, Isbitiren B, Sara S, Erbas G. Regenerative endodontic treatment (revascularization) of immature necrotic molars medicated with calcium hydroxide: a case series. J Endod. 2011;37(9):1327-30. Epub 2011 Jul 13. Jung IY, Lee SJ, Hargreaves KM. Biologically based treatment of immature permanent teeth with pulpal necrosis: a case series. J Endod. 2008;34(7):876–87. Epub 2008 May 16.